Former Mexican presidential candidate Roberto Madrazo was disqualified from the Berlin Marathon after he failed to register on the ChampionChip timing system that registers all runners’ results and split times. In an event this size, stopwatch timekeeping is a thing of the past. The Netherlands based company, ChampionChip, invented time keeping based on RFID tags thirteen years ago. Since this time, hardly any large road race can do without chip timing. 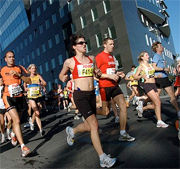 In Berlin, one of the prestigious World Marathon Majors events, ChampionChip systems were placed every 5 km to time the split times of the more than 30.000 participating runners. Originally the Mexican politician finished in a remarkably quick time of 2:41:12, offering him a short moment of glory as the leader of his age group. After analysis of the full results, the timekeepers noted that he had failed to register on the ChampionChip timing systems at 30 and 35 km checkpoints. His recorded speed between the half marathon and the finish line was even quicker than the time of Haile Gebreselassi, the new world record holder. However, in Mexico the damage was already done. Mr. Madrazo ‘s reputation as a politician and marathon runner is under heavy fire. Some 32,500 people finished the Berlin Marathon; about 40 are disqualified every year. As Roberto Madrazo found out, nowadays cheating in a race is impossible thanks to the ChampionChip RFID timing systems. ChampionChip is a Netherlands based company that specializes in sports tracking, tracing, and time keeping. The company produces its own reader technology that reliably measures and registers over 6 million athletes every year in mass participation events timing . With this specialization in this field and over 50 people employed ChampionChip is the market leader in RFID based sports timing for active sports.